What gift could be greater than saving a family from a life of extreme poverty? I am writing this today to tell you about families who were already poor to begin with, but who sank even deeper into poverty due to unnecessary blindness or impaired vision. 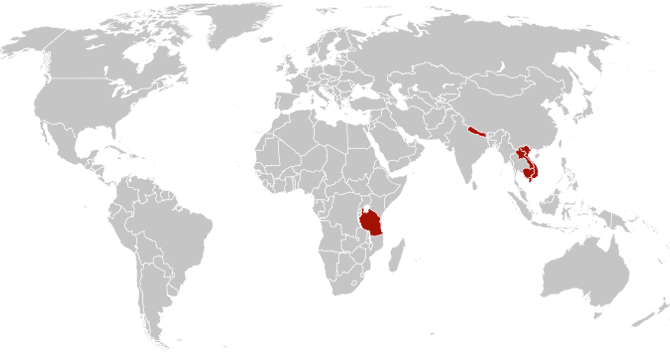 This story takes place in the province of Ratanakiri in north-eastern Cambodia. Grandparents here often live with their children`s family and look after their grandchildren. When a grandparent becomes afflicted by an eye disease and loses his or her vision, it has serious consequences for the entire family. The grandparent becomes completely dependent on care, forcing the parents to work less. They find it increasingly difficult to make ends meet and often the family sinks even deeper into poverty. That is what happened to the family of Kannitha, a young woman with two small children. Because of the impaired vision of her mother, Mrs. Nam, she was forced to work increasingly less hours, because both her children and her mother depended on her care. The family could barely get by and there was no money for school fees or clothing, let alone for an operation for her mother. Mrs. Nam`s eye affliction created ever greater difficulties for the family. Both she herself and her daughter and grandchildren suffered as a result. “My mother wanted to help us, but housekeeping and looking after the children became impossible for her. She was aware of this, which made it even harder for her to bear,” Kannitha said. Then, during a visit to the health centre in her village, Kannitha heard about the new eye clinic in Ratanakiri where her mother might possibly receive help. As you probably know, this eye clinic was built thanks to support from Eye Care Foundation donors. 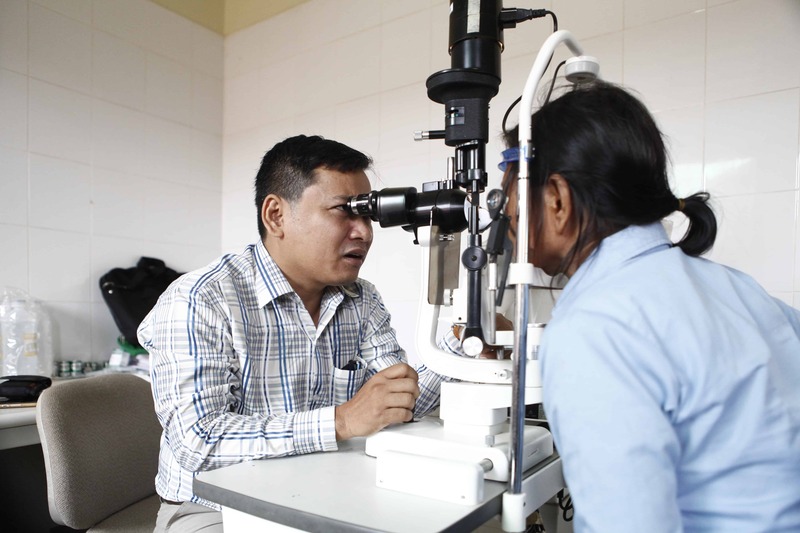 Opthalmologist Dr. Moch Kimhong works at the eye clinic in Ratanakiri. A few weeks ago, Mrs. Nam walked in on the arm of her daughter. Mother and daughter had been waiting in the crowded waiting room for some time before Dr. Moch Kimhong could see them. “My mother is practically blind in both eyes. We travelled a long way to get here because we heard that you might be able to help her”, Kannitha said. Dr. Moch Kimhong nodded and examined Mrs. Nam. He has good instruments and the diagnosis was quickly made. She suffered from advanced cataracts in both eyes. Cataracts cloud the lens of the eye and it was because of this that Mrs. Nam had almost completely lost her vision. Imagine how Kannitha and her mother reacted when the doctor said “You can regain your sight in both eyes, Mrs. Nam. I can do the surgery here in our eye clinic. You don`t have to worry about the cost. The operations on both eyes will be completely free”. This was excellent news for both Mrs. Nam and Kannitha. Two days later Mrs. Nam underwent surgery on her left eye. Kannitha and her children waited in anticipation for the moment when the bandages were removed from her face. What followed was pure joy; for the first time in years a smiling Mrs. Nam looked into the eyes of her daughter and grandchildren. From that moment on everything changed. After the operation on her right eye, Mrs. Nam was able to do everything by herself once again. Now she takes care of her grandchildren after school when her daughter Kannitha is working. Mrs. Nam`s cataract surgery was the start of a better life for all of them. 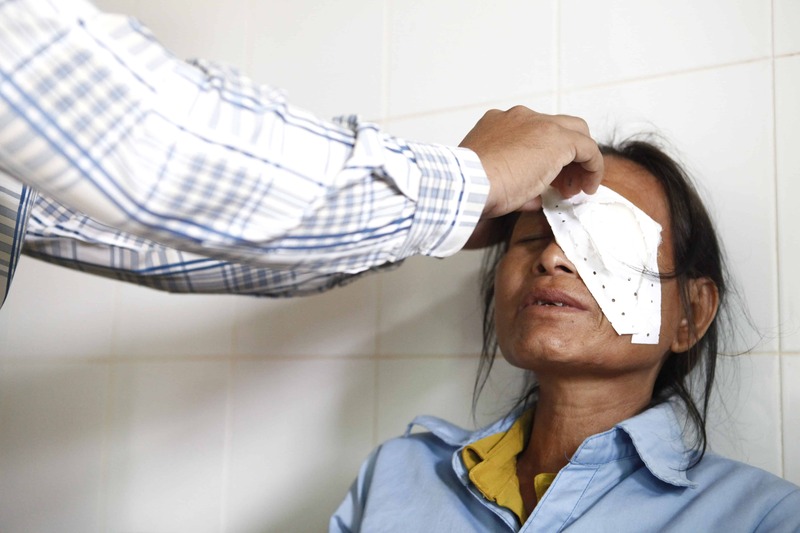 Your support makes cataract surgeries possible. I am deeply grateful to you for that. You help blind or visually impaired people see again. Should you wish to do even more to help these people, you could finance an operation for one of the many cataract patients in Cambodia. Giving someone a life-changing surgery is a beautiful gift. With a donation of €35 you can lift a person out of extreme poverty and give them and their family a chance to improve their lives. Of course we are also happy with any other donation. Your support brings joy back into people`s lives and every person involved is deeply grateful to you for that!